run, zoe, run! : Can you spot a Tall Mom? 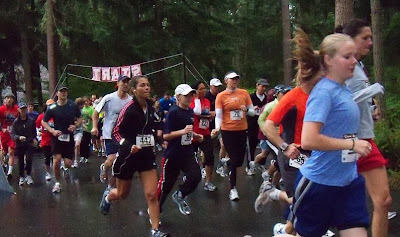 I was going through my Flickr account and looking at past races, and I remembered that Mel from Tall Mom on The Run ran the NW Trek Run Wild race in September. Hmmmm, I thought...my dad and Travis took quite a few photos, maybe Mel is in there somewhere? I spotted her no problem, even without the hint! So how is our little half marathon finisher feeling today??? ha! saw her immediately, too funny! Thanks for stopping by my blog Zoe. Your thoughts are appreciated. And normally I would agree with you about rest. But Sunday was just pur procrastination until it was too late to run. This early in a cycle I shouldn't need the rest yet. If I do, then I'm in trouble. Too funny! I spotted her right away. Small world. lol. cornball! and you are kind of a stalker? ;) haha. What in the Monkey am I doing with my arm?? So WEIRD!! I love that you did this Zoe...crack me up that we were at the same race but had no idea..
What did your other 1/2 say about Mercer Island?? Note Muscle Man is just behind the lady with the black shirt and punk stripes.. It was his birthday and I left him in the dust just after the gun went off.. I am a little competitive..